Refreshing old articles on your website or blog is a good way to improve search engine ranking. The problem is how to promote updated posts on your site to visitors. Here are two methods you can use. Google prefers to direct people to fresh new content that answers their questions or meets their information requirements and because of this, new posts on your website will therefore appear high in search results than old ones. As an article ages and it becomes increasingly older, Google assumes that it is less relevant to people searching. For example, an article written in the last month is assumed to be more relevant than an article written last year or two years ago, and especially one written five years ago. Information ages and what was true last year may not be true now and so as articles get older, they fall down the search engine results and the ranking is lowered. If you prevent articles from aging by refreshing them and adding new content, they maintain their position in search results much better. In fact, some people have even found that they rise in the search results. So if an article has dropped to page two or three, it may be able to get back onto page one of search results with an update and refresh. For this reason you should regularly pick out old posts on your website and take a new look at them. Here is what you need to do. Are there any subheadings that could be added to break up the text? Google, Bing and other search engines will sooner or later discover an updated article by crawling your website and they will take appropriate action. They love new and updated content. Will your site’s visitors notice though? How do you promote updated content to visitors when it is buried deep in your site? They won’t find it by accident and you need some way to make it visible to people visiting your site. 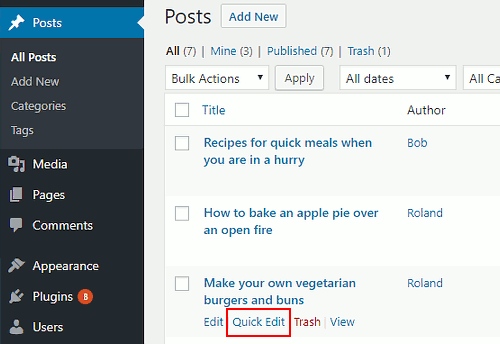 WordPress automatically makes new posts appear first on your site on the home page, blog page or archive listing. This means that they are the first thing people see when visiting your site. Ideally, an old article that you have refreshed and added content to should appear first, as if it is new. Then visitors will discover it when they visit the home page. There are several ways to make an article appear first and the method you choose depends on the URL structure of your website. Before you change anything, you first need to look at the WordPress settings used for URLs. 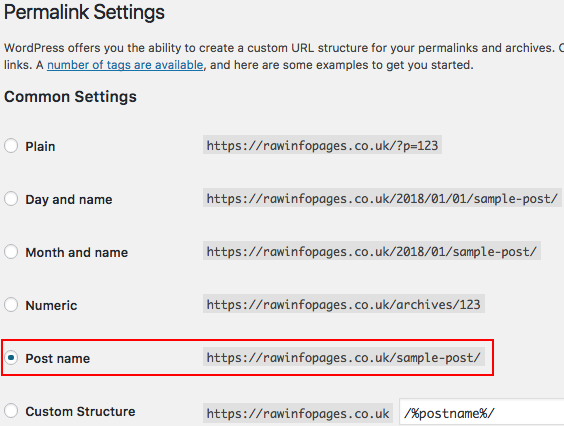 The URL structure that WordPress uses is defined in the Settings. Go to Settings > Permalinks. There are several common settings, as shown in the screenshot below, but which one is the best to use? Simplicity and readability always wins and Post name is the one you should select. It is best for search engines and for people. If you are setting up a new website, select this option because it will improve SEO and it makes it easier for visitors to read and remember. Do not change the permalink setting for an existing website because every URL on the site will change. That breaks all links everywhere! Technically it is possible to switch permalink options, but you need a lot of expert knowledge to do so and to avoid breaking the site. Leave it alone. 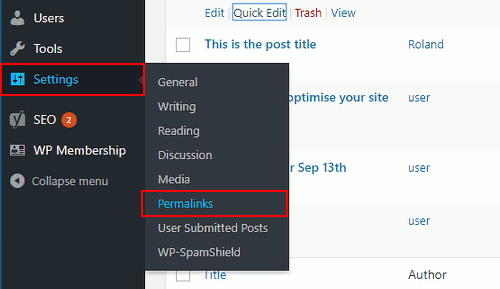 The reason for looking at Permalinks is to see whether your site uses the date in the URL of posts. Posts in WordPress always appear in date order with the newest first. Therefore, if we change the date of an old post that we have refreshed and updated to be the newest, it will appear first. It will be on the home page, archive page or blog section of your site and right in front of visitors’ eyes. If you do not use the Day and name or Month and name permalinks, go ahead and change a post’s date when you update and refresh it. If you do use them, never change the date or you will break links to the post. Let’s see how to put a refreshed post onto the home page of your site by changing the date. Click Posts in the sidebar and move the mouse over a post in the list. Four links appear below the title and the one we want is Quick Edit. Quick Edit enables you to easily change certain settings associated with a post. One of these is the published date and you can easily change it using the controls. Set the date to today’s date to fool WordPress into thinking it is the most recently published article. Click the Update button on the right to save the changes and then refresh the web page. You will see that the post has risen to the top of the posts list. It was third (see screenshot above), but now it is first. If your website does not use the date in the URL of posts then the above method works great. If your website does use the date in URLs, you cannot change the post date and a different method must be used. To make a post the first on your site, make it sticky. It sticks to the top of the posts lists no matter what you do and this makes it the first item on your home page or blog page. Use Quick Edit again, but this time look to the right hand side and there is a checkbox to Make this post sticky. Tick the box. This is not quite as convenient as changing the date because it will remain the first item on your site even when you publish newer posts. It sticks there forever, well at least until you clear the sticky checkbox. It can be useful to make a post sticky for a week or two so visitors to your site can see the updated post, but sooner or later you will need to make it non-sticky. You can see all sticky posts by clicking the link on the Posts page. Refresh an old post today! It is good for search engine ranking. 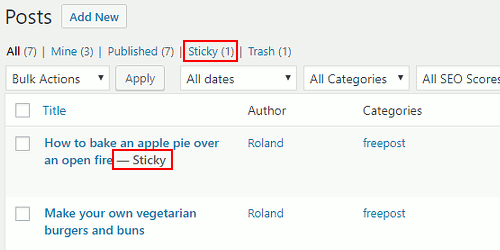 Make it easy for visitors to find the updated article by changing the date or by making it sticky. It then appears first on your website home page, blog page and archive page. Wow these are great tips! I’m always looking for ways to boost SEO as a new blogger, so I will be saving these tips. Thank you! This could not have come at a better time! Thanks so much for the ideas! I wonder if there are any adverse impacts of changing the date? Does it impact past data in any ways? Providing the date is not used in the URL, I cannot think of any negative effects of changing it. Search engines will notice and they will also notice the updated content. This will boost search ranking.